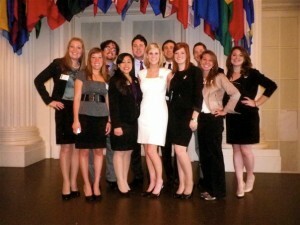 Baylor students in the Hall of the Americas, OAS Building, Washington, D.C. L to R: Torie Rhodes, Jenna Thompson, Robert Bradfield, Cindy Linkenhoger, Chris Mahfouz, Catherine Gibson, Michael Lyssy, BB Sanford, Cody Brasher, Brittany Harris, Amanda Honey Missing: Rafael Deliz Aguirre, Dr. Supplee This past week, from March 29-April 3, 2011 Baylor University sent a team of students to Washington D.C. to participate in a simulation of the Organization of American States (OAS). Eleven schools from Latin America joined the nineteen schools from around the United States to represent thirty countries from Hemisphere in the model. The delegation from Baylor represented the country of Panama and had the unique opportunity not only to meet the Permanent Ambassador from Panama to the OAS, Dr. Guillermo Cochez, but also to attend high level important meetings of all the ambassadors at the OAS building. In addition to debating issues important to the Hemisphere, students were addressed by Mr. Gerard C. Anderson, OAS Secretary for Administration and Finance and Mr. Albert R. Ramdin, OAS Assistant Secretary General. Michael Lyssy, Baylor Internal Vice-President (Junior, International Studies, Fall City, Texas) served as president of the model, a position he was elected to at last year's model. Seniors BB Sanford (International Studies, Sachse, Texas) and Catherine Gibson (Latin American Studies, Bedford, Texas) participated in the General Committee and led the other delegations in resolving a crisis scenario. Ms. Gibson was elected as president for the 2012 model, making it the fourth year in a row that a Baylor student has served as the president of the model. Senior Jenna Thompson (International Studies/Journalism, Indianapolis, Indiana) sat on the committee for Political and Juridical Affairs while Junior Cindy Linkenhoger (Finance, Harlingen, Texas) served as vice-chair and won the chair for the coming model. Juniors Rob Bradfield (Theater Arts, Waco, Texas) and Cody Brasher (International Studies/Psychology, Moody, Alabama) led debate in the committee on Hemispheric Security. Junior Amanda Honey (History/Entrepreneurship, Celina, Texas) co-head delegate and Senior Torie Rhodes (International Studies, Pasadena, California) worked in the committee for Integral Development. Ms. Honey won election as chair-person for the 2012 model. Senior Chris Mahfouz (University Scholar, Port Neches, Texas) and Junior Brittany Harris (Financial Planning, Parker, Texas) served on the Administrative and Budgetary Affairs Committee and won the award for best resolution in their committee (one of four awards given during the model). Sophomore Rafael Deliz Aguirre (Biology, San Juan, Puerto Rico) served as rapporteur for the model. The students are very proud of their accomplishments, but have said that they feel the most rewarding experience of the trip has not been winning positions or awards, but learning the issues that are important to the Hemisphere and how to resolve them.